I have the FT5 working, and even have the e3d aero installed....and working. My next challenge is to get the (genuine....not an imitation) BLTouch installed and the Marlin firmware updated. Does anyone have a clear list of all the firmware (config h) changes that are required? I have the ft 5 version of Marlin, V3 Arduino 1.6.7. Lots of ionfo out there, but altogether, quite confusing. You can get the whole FW off the FB group files. Not sure if they are here or not. There are a few changes that do need to be made. You can find the FB group by clicking the "Facebook" link at the top of the page. Ok...I have looked at tons of videos and also read a lot of facebook and folgerforum discussions. I guess, maybe, I'm looking for something that doesn't exist. None of the information available is clear enough (to me) for me to undertake the perceived BLTouch required firmware changes. I have no problem wiring the BLTouch into the ft5. I have the stock ft5 firmware (FT5_Marlin_v3|Arduino 1.6.7)...and am hoping to find a working (proven) version of the config h files, where I can just go into my config h and make the identified changes. 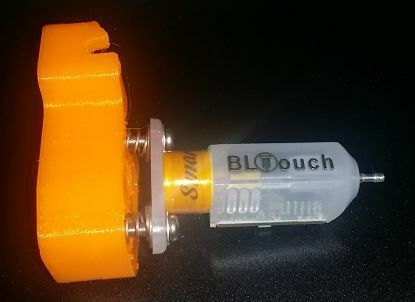 If there is anyone out there, that has a working ft 5 with (genuine...not clone) BLTouch autolevel, you would do many of us novices a favor by simply posting the functioning config h information. Winkelman posted a file (the whole Marlin code, but you can just unzip it and look at the configuration.h code) over on the facebook group. Look in the files section. Great. I'll take a look at that. I have looked at Winkelman's file and will give it a shot after I finish the BLTouch wiring. I want to save the existing config h, as an emergency fallback, just in case I run into problems with the BlTouch firmware.Is it as simple as saving the text (in MS Word)....loading the new config h files, and then, if needed, fallback to deleting the BLTouch config h and pasting the previous (working) version. Of course, with these actions, need to always verify and upload. Also, When uploading, is there any need for any additional eeprom actions? Does anyone know what the two springs in BL Touch (Smart) are for ? I don't know much about Marlin or Arduino, sorry. Some say they are for looks. They are actually there if you want to use an adjustable mount. Basically using the springs as a spacer between the top of the BL Touch and the mount itself. You would tighten the mounting screws to raise the sensor. I have heard they also work well as protection from bed hits if the pin gets stuck out. On my prototype machine, mine is mounted solid. I asked ANTCLABS, and this is their reply: We found that many of our customers are using springs like this photo, so we just added this for gift. If you don't need, you don't have to use this. Yup, exactly what I was trying to explain. Thanks for the image, I fixed it. What version od Marlin is this based on? Where in Marlin may I find version number? Please start a new topic, this one is/was 9 months old.